Skeletons are monsters that will shoot Arrows from a Bow at their enemy. They spawn in the Overworld or Nether and will only appear in dark area’s like caves or at night. Skeletons will light on fire from sunlight just like Zombies if they are not under shade or in water. 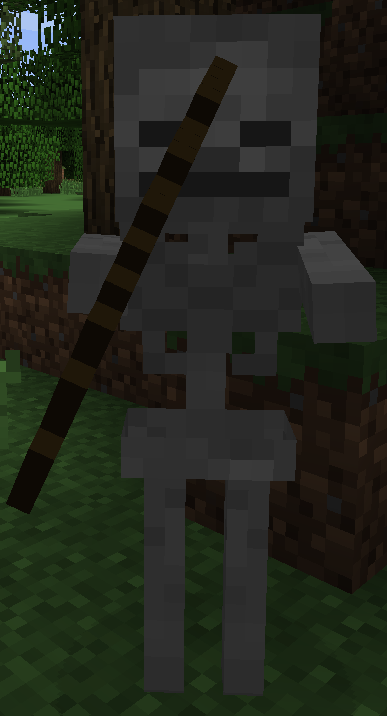 A skeleton mob can drop 0-2 Bones, 0-2 Arrows, a Bow, and 5 experience points. If a creeper is killed by a skeleton Arrows then it will drop a Music Disk. If a skeleton has a Helmet on they will also not burn until the Helmet has lost its durability and is destroyed. They are able to pick up or spawn with armor which may drop from it.